1 cup of chopped onions contains 60 calories and 0 g of fat. They also contain vitamins B9 and C as well as minerals. Onions are most nutritious when eaten raw. 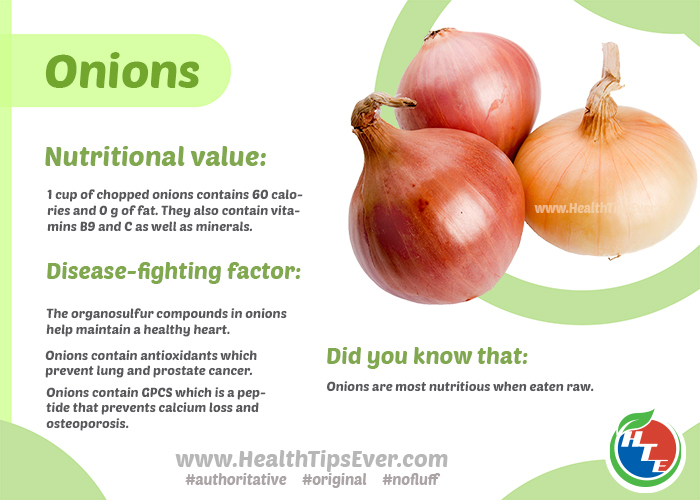 The organosulfur compounds in onions help maintain a healthy heart. Onions contain antioxidants which prevent lung and prostate cancer. Onions contain GPCS (γ-Glutamyl-propenyl-cysteine sulfoxide) which is a peptide that prevents calcium loss and osteoporosis.